Larsen explains how to ask the right questions—from the Oval Office to the front office to your kitchen table. …Larsen might be seen as profiting from fear of terrorist attacks. Refreshingly, he blows the whistle on fearmongers, while for the most part maintaining an understated tone. Larsen criticizes government officials at all levels—Republicans, Democrats and those without political party labels—for spending billions of dollars without a logical rationale…The author delivers on his promise for a commonsense guide. 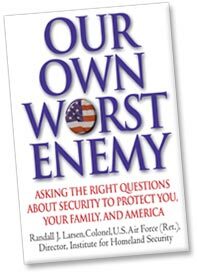 …should be required reading for all who are concerned about national security… For me, it proved to be an all-absorbing page by page tableau, comprised of provocative ideas, eminently rational concepts and well-skewered current ideas and initiatives.